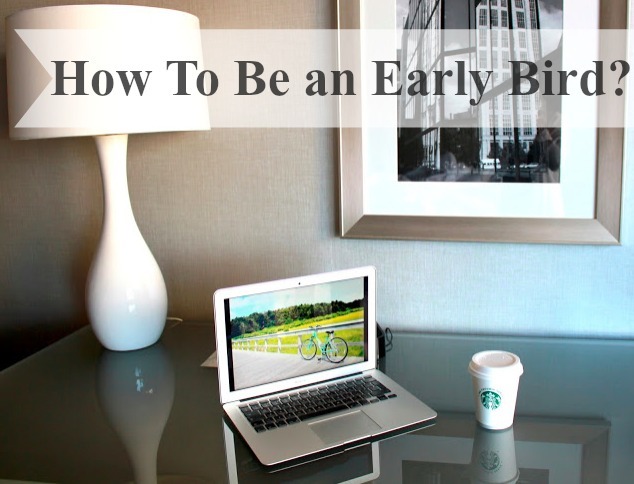 Are you an early bird? If you are not but would like to start waking up earlier, this post is for you. I am not going to lie, there is not one magical way to do that rather than to have your alarm on and trying to wake up (I know, how surprising!). You know what time you want to start waking up at? Great! Instead of shocking your body with time change try to wake up every day 10 or 15 minutes earlier. 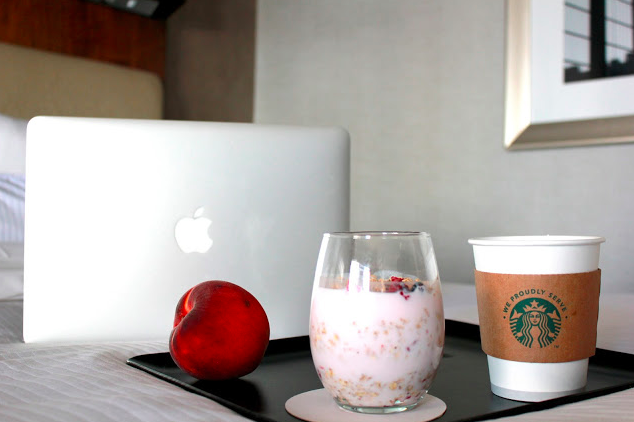 Everything depends how quickly you want to start waking up early and how early. Is your New year resolution to wake up by 6 am everyday? Prepare your body now to help your strong will (you so can do it!). If you are lucky and not in rush to start waking up at 6am or any other time, you can do what I do. I change my waking up time every Monday to ten minutes earlier. It takes a few weeks but for me it works so much better (Sometimes I just think that I am not biologically programmed for early mornings but that's not an excuse). I placed my phone with alarm on the other side of the bed so I am forced to move to switch it off. Usually that is enough to wake me up. I have water bottle nearby alarm as a sip helps me to wake up my body internally. The main thing for me was to leave the bed as quickly as I woke up, no snoozing (tough love). After snoozing alarm, I would only be more sleepy and demotivated to wake up. I know you might not want to, but there is no other way than to get off your bed (I am still working on a magical way, if you have secret knowledge share in comments!). The coldest is outside, the harder and harder is waking up for me. I decided to have my morning routine to make mornings easier, fluffier and happier and I share it with you here. Switch on the light, pull up blinds and start your fantastic, early morning. Think what can make it easier for you. Would automatically switching on radio be a better way for you to wake up? Personally, that would not be an ideal for me as it reminds me of early mornings when my mum would wake me up to school. So many years later and I still can remember annoying voice saying “Gooooooood morning! It’s a beautiful day!”. It gives me shivers and instantly makes me irritated thus, I have sound of birds getting progressively louder and louder as I fail to switch alarm off. I also noticed that I prefer heavier breakfasts and lunches instead of heavy late dinners. I am trying to have my last meal by around 3 hours before my bedtime. Also do not forget that when you wake up earlier, your body needs to regenerate so jump into your bed slightly earlier as well. At the beginning you might have troubles with falling asleep but as days pass your body will have to adjust. There might be a time when you are in bed thinking “this is not working for me”, but give yourself at least a few days more before you give up. Go to bed convinced that you want to get up tomorrow. As there is no one golden rule on how to wake up early, what are your suggestions? 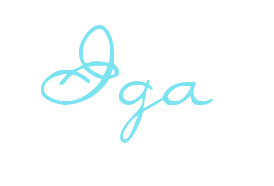 I've been waking up early with the intention of excerising. I just set my alarm half an hour early, roll out of bed and put my workout clothes on then go for a brisk 20 min walk while listening to a podcast. That def wakes me up. But you're right it does take some time to get used to it. I've always hated waking up early, especially in winter when it's so dark outside. No matter the clock, if it's dark, it means more sleeping to me. But ironically, my job now requires me to start working at 7 a.m. so I have to get up at least at 6:30. And it was really hard at first (good thing it all started in summer so it was very sunny at 6:30 and I had time to adjust) but the most important thing is to stay persistent. The body eventually gets used to waking up early and I had this period for about a month that I woke up exactly 5 minutes before the alarm every single day. I struggle so much with this because of my shift work, it's hard to get into a routine! I'm such a night owl too, which doesnt help. I love the idea of setting an alarm earlier and earlier. Such a simple concept, yet one I never thought of. Such a great way of conditioning yourself to get out of bed. Great tips, and I am definitely going to try and utilize some of them! I am trying to start waking up at 6 again! So alarm rule is back on!